To reach the old town of Ribadavia you pass by the castle’s main entrance and follow your nose. A short distance away lies the Praza Maior (main square) with a wealth of attractive and architecturally interesting buildings around it. This area forms the heart of Ribadavia’s old quarter. 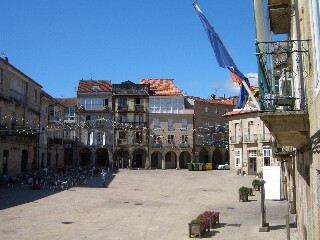 The square is actually in the form of a distorted rectangle and it really is very attractive and totally Galician in character. I thought it was very comparable to, but on a smaller scale than, the similarly named plaza in Ourense city. 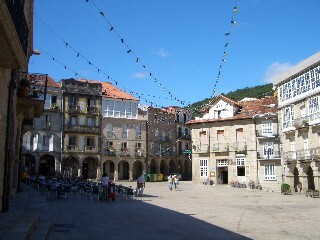 Several of the square’s buildings have arched and colonnaded walkways under them and many feature the Galician trait of galeria balconies on their upper levels. Granite is the building material of choice with red tiled roofs and some more traditional open balconies adding to the mix. Not surprisingly, this area has a number of bars (at least five) along with a tiny and very narrow church that sits sandwiched between two other buildings. It is a great spot to stop for a drink and no doubt has an atmosphere of its own at night – we noted that there were lots of additional hanging lights in place, undoubtedly in anticipation of the August festivities. Leaving the Praza Maior can be achieved via one of two narrow streets, both of which descend to the lower region of the old district and the area once populated by the town’s Jewish community. We opted for the passage adjacent to the square’s tiny church and ultimately re-entered (by coincidence) the plaza from the other narrow street. Incidently, the town’s second tourist office is located on this square in the Pazo dos Condes de Ribadavia and it also had a photocopied A4 guide to the town’s main tourist spots in English. Moving away from Ribadavia’s Prazo Maior you walk down narrow and sometimes winding alleys which can be quite steep. At the junctions of the crossing streets things level off and you often find something interesting like the 12th century Iglesia (church) de San Juan, built in the Romanesque style with a Baroque altar. 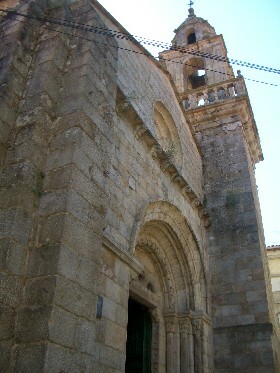 This church (and a hostel) was used extensively by pilgrims on the Braga Camino (route from Portugal) right through to the sixteenth century. Also close to the spot of the Iglesia de San Juan is one of Ribadavia’s formerly important and imposing (in its use at least) buildings, the casa de la Inquisicion. This building has four coats of arms emblazoned on it and each represents the shield of the families holding high religious office in the town, one assumes the local inquisitors! The tomb of one of the most important members of this clan is to be found in another of Ribadavia’s churches, that of Saint Dominic. 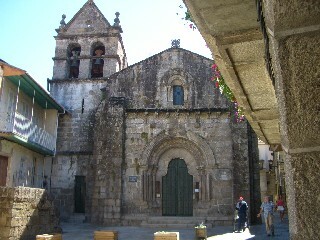 Two other churches of note are the Iglesia de Santa Maria Magdalena and the Iglesia de Santiago (church of Saint James). The church of Magdalena is 18th century baroque, but its origin can be traced to the twelfth century. The history of this church is also interesting because after the practicing Jews of the area were expelled in the late 15th century, this church became the one used by any Jews who chose to stay and convert to the Roman Catholic faith. It has an open bell tower and a narrow elliptical window at high level on the main façade. The church of Santiago is twelfth century and Romanesque in style, but with a predominantly Baroque interior. Externally its dominant feature is its circular turret like tower and the arched windows that cut into it. It also has a simple but elegant portico and a multi paned rose window above the portico. The most significant internal feature is an image of Saint James and this originates from the 14th century. 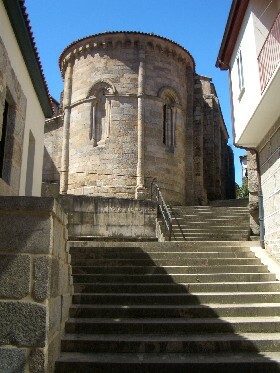 Next to this church is a small museum, once a pazo.